Bedford Blues have added 21-year-old Harlequins scrum half Jordan Burns to their squad for the 2015/16 Greene King IPA Championship season. 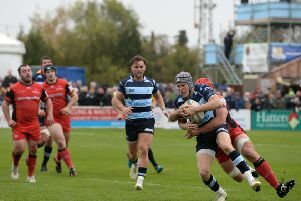 Burns, who started life playing on the wing before switching to nine, has signed a permanent deal with the Goldington Road club and has joined up with his new team-mates for pre-season training. Speaking about the capture of Burns, Blues Director of Rugby Mike Rayer said: “Jordan is an exceptional young player who has flourished since making the move to number nine. “Having come through the Harlequins Academy and spending time with Richmond last season, Jordan is ready to step up to the Championship and I’m delighted that he has chosen to join us. Burns, who made five appearances for Harlequins, has a reputation for being a true speedster having recorded an impressive time of 10.8 seconds in the 100me sprint whilst at school and then transferred that to the rugby field when he ran in four tries for England U18s in a game against Northampton Saints Academy in 2012.